Imagine that is holding a rope in one’s hand at that the rope is tied at the end to brick wall. If one suddenly jerks the rope it would cause a pulse formation that would travel along the rope until hitting the brick wall. At every instant of time you could fairly reasonably ascribe a position to this wave pulse but on the other hand if you would be asked to calculate its wavelength you wouldn’t know how to do it since this phenomenon isn’t periodic. Imagine now that, instead of just producing one jerk, you continuously wave the rope so that you end up producing a standing wave. In this case the wavelength is perfectly defined, since this a phenomenon that is periodic, but the wave position loses its meaning. Quantum mechanics, as we’ll see in later posts, asks for a particle description that is given in terms of wave packets. Roughly speaking, a wave packet is the result of summing an infinite number of waves (with different wave numbers and phases) that exhibit constructive interference in just a small region of space. An infinite number of waves with different momenta is needed to ensure constructive and destructive interference in the appropriate regions of space. Hence we see that by summing more and more waves we are able to make the position of the particle more and more defined while simultaneously making its momentum less and less defined (remember that the waves that we are summing all have different momenta). In a more formal language one would say that one is working in two different spaces. The position space and the momentum space. What we’re seeing is that in the wave packet formalism it is impossible to have a phenomenon that is perfectly localized in both spaces at the same time. More physically speaking this means that for a particle its position and momentum have an inherent spread. One can theoretically make the spread of one of the quantities as small as one wants but that would cause the spread in the other quantity to get larger and larger. That is to say the more localized a particle is the more its momentum is spread and the more precise a particle’s momentum is the more fuzzy is its position. This result is known as Heisenberg’s uncertainty principle and one can make it a mathematically rigorous, but for now this handwaving argument is enough. With it we can already see that Quantum Mechanics needs a radical new way of confronting reality. One can interpret the uncertainty principle in the language of measurements being made on an ensemble of identically prepared systems. Imagine that you prepare an ensemble whose position measurements are very defined. That is to say that every time you measure the position of a particle the results are very much alike. Well, in this case if you were to also measure the momentum of each particle you would see that the values of momentum you’d end up measuring would be wildly different. On the other hand you could possibly want to have an ensemble of particles whose momentum measurements would end up with values that have small differences between them. In this case the price to pay would be that the positions of the particles would be scattered all over the place. Evidently that between those two extremes there is a plethora of possible results. The only limitation that the uncertainty principle stipulates is that the product of the spreads of the two quantities has to be bigger than . For what potential energy function does satisfy the Schroedinger equation? Calculate the expectation values of , , and . Find and . Is their product consistent with the uncertainty principle? The product is consistent with the uncertainty principle. Neophytes interpret the previous equations as if it was saying that the expectation value coincides with the average of various measurements of the position of a particle that is described by . This interpretation is wrong since the first measurement will make the wave function collapse to the value that is actually obtained and if the following measurements of the position are done right away they’ll just be of the same value of the first measurement. We have a single particle. Then after a position measurement is made we have to able to make the particle to return to its state before we make a new measurement. We have a collection – a statistical ensemble is a more respectable name – of a great number of particles (in order for it to be statistically significant) and we arrange them all to be in state . If we perform the measurement of the position of all this particles, then average of the measurements should be . The expectation value is the average of repeated measurements on an ensemble of identically prepared systems. where we have used integration by parts and the fact that the wave function has to be square integrable which is to say that the function is vanishingly small as approaches infinity. the functions that are in Hilbert space are necessarily square integrable. The problem is that many times we need to calculate quantities that depend not on a given function but on its derivative (for example), but just because a function is square integrable it doesn’t mean that its derivative also is. Hence we don’t have any mathematical guarantee that most of the integrals that we are computing actually converge. Since a particle doesn’t have a definitive position prior to is measurement it also can’t have a well defined velocity. Later on we’ll see how how to construct the probability density for velocity in the state . For the purposes of the present section we’ll just postulate that the expectation value of the velocity is equal to the time derivative of the expectation value of position. After knowing how to calculate the expectation value of these two dynamical quantities the question now is how can one calculate the expectation value of other dynamical quantities of interest? The thing is that all dynamical quantities can be expressed as functions of of and . Taking this into account one just has to write the appropriate function of the quantity of interest in terms of and and then calculate the expectation value. As an example let us look into what would be the relevant expression for the kinetic energy the relevant definition can be found at Newtonian Mechanics 01. Henceforth we’ll use to denote the kinetic energy instead of in order to use the same notation that is used in Introduction to Quantum Mechanics (2nd Edition). pull the time derivative over onto , note that and conclude that ? Because integration by parts can only be used when the differentiation and integration are done with the same variable. The Scroedinger equation is a linear partial differential equation. As such, if is a solution to it, then (where is a complex constant) also is a solution. The previous equations states the quite obvious fact that the particle under study has to be in some place at a given instant. Since was a complex constant the normalization condition fixes in absolute value but can’t tell us nothing regarding its phase. Apparently once again one is haunted with the perspective of having an infinite number of solutions to any given physical problem. The things is that this time the phase doesn’t carry any physical significance (a fact that will be demonstrated later) and thus we actually have just one physical solution. In the previous discussion one is obviously assuming that the wave function is normalizable. That is to say that the function doesn’t blow up and vanishes quickly enough at infinity so that the integral being computed makes sense. At this level it is customary to say that these wave functions don’t represent physical states but that isn’t exactly true. A wave function that isn’t normalizable because integral is infinite might represent a beam of particles in a scattering experiment. The fact that the integral diverges to infinity can then be said to represent the fact that beam is composed by an infinite amount of particles. While the identically null wave function represents the absence of particles. A question that now arises has to do with the consistency of our normalization and this is a very sensible question. The point is that we normalize the Schroedinger equation for a given time instant, so how does one know that the normalization holds for other times? Let us look into the time evolution of our normalization condition 15. Since we’re assuming that our wave function is normalizable the wave function (and its complex conjugate) must vanish for and . Since the derivative vanishes one can conclude that the integral is constant. In conclusion one can say that if one normalizes the wave equation for a given time interval it stays normalized for all time intervals. Where is the particle most likely to be found at ? 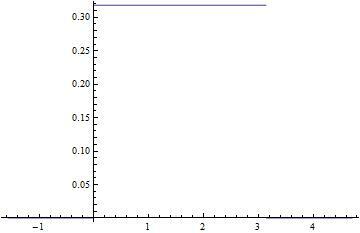 Since is maximum of the function the most likely value for the particle to be found is at . What is the probability of finding the particle to the left of ? Check the answers for and . At first let us look into the limiting case. We can imagine that this is the end result of getting nearer and nearer to . That is to say that the domain of the strictly decreasing part of is getting shorter and shorter and when finally doesn’t have a domain where its is strictly decreasing and is defined by its strictly increasing and vanishing features (in the appropriate domains). That is to say that to the right of the function is . Hence the probability of the particle being found to the left of is .From the previous calculation which is indeed the correct result. is the half point of the domain of where is non vanishing (end points of the domain are excluded). is strictly increasing in the first half of the domain ( ). is strictly decreasing in the second half of the domain ( ). Thus one can conclude that is symmetric around and consequently the probability of the particle being found to the left of has to be . From the previous calculation which is indeed the correct result. What is the expectation value of ? where , and are positive real constants. Determine and The integral is vanishing because we’re calculating the integral of an odd function between symmetrical limits. Find the standard deviation of . Sketch the graph of . What is the probability that the particle will be found outside the range ? As we can see the first derivative of changes its sign on from positive to negative. Hence it was strictly increasing before and it is strictly decreasing after . Hence is a maximum of . The second derivative is always positive so is always concave up (convex). Which confirms the second equation for the standard deviation. Exercise 2 Consider the first digits in the decimal expansion of . What is the probability of getting each of the 10 digits assuming that one selects a digit at random. The most probable digit is . The median digit is . The average is . Exercise 3 The needle on a broken car is free to swing, and bounces perfectly off the pins on either end, so that if you give it a flick it is equally likely to come to rest at any angle between and . Along the interval the probability of the needle flicking an angle is . Given the definition of probability density it is . Additionally the probability density also needs to be normalized. And the standard deviation is . We’ll leave as an exercise for the reader. As a hint remember that . For the distance to the mean to be more than one standard deviation away from the average we have two alternatives. The first is the interval and the second is . Hence the total probability is the sum of these two probabilities. Let denote the probability of the first interval and denote the probability of the second interval. If you don’t see why check this post on my other blog. Now as in the previous calculation. For the third term it is . The first integral is the hard one and a special technique can be employed to evaluate it. The resolution of exercise 2 was done using some basic Mathematica code which I’ll post here hoping that it can be helpful to the readers of this blog. In the previous post we were introduced to the Schrodinger equation (equation 1), stated Born’s interpretation of what is the physical meaning of the wave function and took a little glimpse into some philosophical positions one might have regarding Quantum Mechanics. Since probability plays such an essential role in Quantum Mechanics it seems that a brief revision of some of its concepts is in order so that we are sure that we have the tools that allows one to do Quantum Mechanics. Adopting a frequentist definition of probability Griffiths then makes a number of definitions of probability concepts under the assumption that the phenomena at study are discrete ones. Definition 1 The probability of an event , is proportional to the number elements that have the property and inversely proportional to the total elements ( ) under study. After defining we can also define what is the most probable value for . Definition 2 The most value for is the one for which is a maximum. After introducing the definition of maximum of a probability distribution it is time to introduce a couple of definitions that relate t the symmetry and spread of a distribution. Definition 4 The median is the value of for which the probability of having a larger value than is the same as the probability of having a value with a smaller value than . After seeing a definition that relates to the the symmetry of a distribution we’ll introduce a definition that is an indication of its spread. 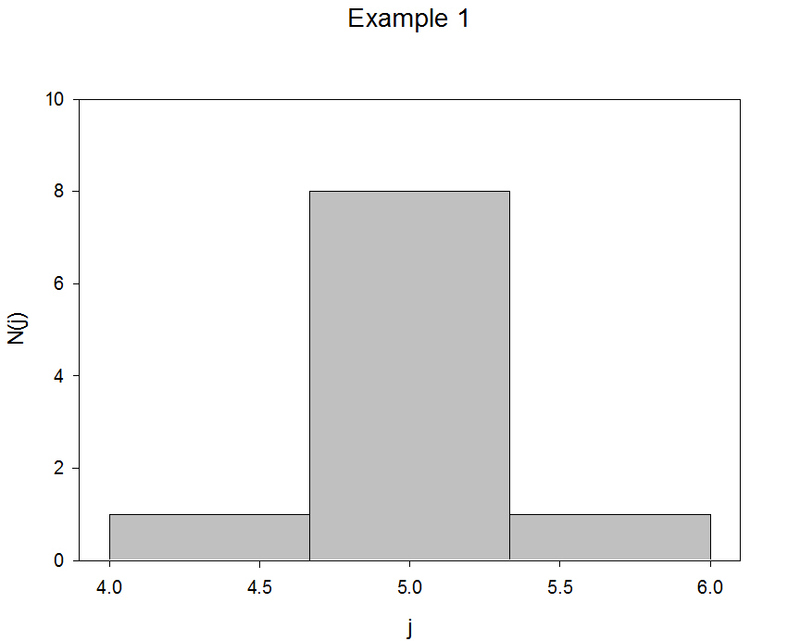 Both histograms have the same median, the same average, the same most probable value and the same number of elements. Nevertheless it is visually obvious that the two histograms represent two different kinds of phenomena. 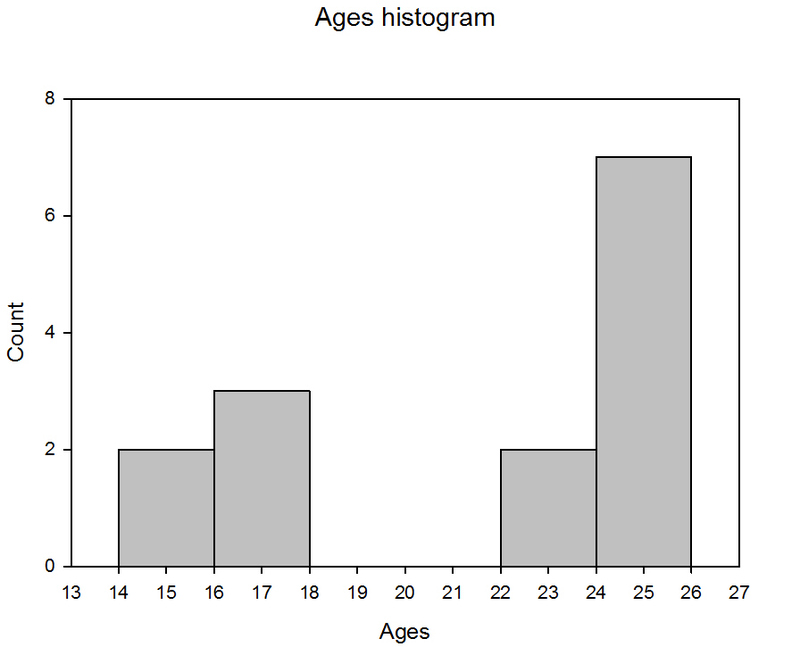 The first histogram represents a phenomenon whose values are sharply peaked about the average (central) value. 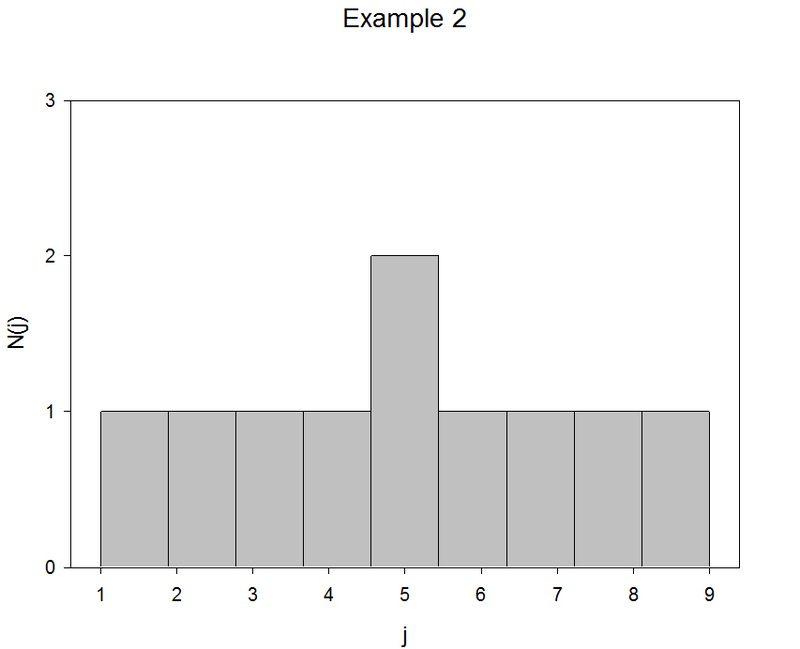 The second histogram on the other hand represents a phenomenon represents a more broad and flat distribution. The existence of such a difference in two otherwise equal distributions introduces the necessity of introducing a measure of spread. This approach doesn’t work since that for random distributions one would expect to find equally positive and negative values for . One way to circumvent this issue would be to use , and even though this approach does work theoretically it has the problem of not using a differentiable function. These two issues are avoided if one uses the squares of the deviations about the average. The quantity of interest in called the variance of the distribution. Definition 6 The standard deviation, , of a distribution is given by the square root of its variance. where equality only happens when the distribution is composed of equal elements and equal elements only. Thus far we’ve always assumed that we are dealing with discrete variables. To generalize our definitions and results to continuous distributions. One has to have the initial care to note that when dealing with phenomena that allow for a description that is continuous probabilities of finding a given value are vanishing, and that one should talk about the probability of a given interval. The quantity is the probability density. I have one class left before having finished my undergraduate coursework in quantum mechanics. I would like to share my experience in that course and some of what I have learned in that course with you all. I will be describing the topics we learned in some level of detail, so those of you who have no experience with quantum mechanics can know some of what to expect here, but without the mathematics that our friend Ateixeira intends on going into. The assigned text, Gasiorowicz, was poor as a pedagogical book in my opinion. I had to look elsewhere. I made extensive use of the book by Nouredine Zettili which was fantastic from a pedagogical standpoint. I also used Schaum’s Outline of Quantum Mechanics as a supplement. I know many in my class used Griffiths to supplement the class text, which is what I believe we will be following here, and I heard many great things about it, though I did not use it personally. Despite having a poor text, I currently have an A in the class, and if I do reasonably well on my final that should not change. Now, before describing any of these topics, I’d like to briefly talk about quantum mechanics in general. My professor sort of assumed we had a working knowledge of the postulates of quantum mechanics, and the 1-dimensional Schrodinger equation and its application. On the first day of class he presented the three dimensional Schrodinger equation and over the next three weeks proceeded to solve it for a central potential (the hydrogen atom). I did not have a working knowledge of the Schroedinger equation, so I had a lot of catching up to do. Thankfully, for this there was Zettili. Because of my struggles to understand the material and the beginning of the semester, I don’t want to simply jump into what my coursework was before discussing quantum mechanics in general as an aside. Quantum theory gives us a stochastic description of nature, and does away with Newtonian determinism. From a philosophical perspective, this to me is the most stunning implication of quantum mechanics, though I do not wish to take much time in discussing philosophy here. In quantum mechanics, a particle is completely described by its wavefunction . Observable information about a particle can be extracted from the wavefunction by applying an operator to it. In the Schrodinger equation above, is the kinetic energy operator whereas V(r) represents a generic potential energy operator. E is a numerical value for energy. Basically, the version of the Schrodinger equation I have presented above allows you to calculate the possible energy values that a particle is allowed to take for a given potential. Once the differential equation is solved for the wavefunction and the energy values that its allowed to take the probability of finding the particle at any of those energy values is easily computed. As mentioned, this is not the only version of the Schrodinger equation, and others are more appropriate for different physical situations. I should mention, however, that there are a very limited number of cases that the Schrodinger method is exactly solvable, and for most physical situations approximation techniques need to be applied. To find solutions to the Schrodinger equation for the electron with the above potential the Schrodinger equation is represented in spherical coordinates since the Coulomb potential is isotropic, and separation of variables is applied. The calculation is involved, and took the professor about 7 hours to solve, however there were some interesting results that emerged. The wavefunction solutions to the hydrogen atom are known as orbital. Three numbers, known as quantum numbers, define each orbital. There is the principal quantum number which is associated with the energy associated with an orbital, the angular momentum quantum number which determines the magnitude of the angular momentum of an orbital, and the magnetic quantum number which determines the projection of the angular momentum operator. Once the wavefunctions that solve the Schrodinger equation for the Coulomb potential are known, the energy spectrum of the hydrogen atom is also known. When an electron transitions from one orbital to another, the energy that it has lost is emitted as a photon. Since the energy associated with a photon determines the color of the photon, knowing the wavefunctions of the hydrogen atom allow us to calculate the entire spectrum of the hydrogen atom based on the electron’s transitions between orbitals. Of everything I have learned, I believe this is the most striking demonstration of the power of quantum theory. With it we can now explain the entire hydrogen spectrum. I should stress here that though the Schrodinger equation is exactly solvable for the Coulomb potential, that does not mean we have a complete description of the hydrogen atom. The Schrodinger equation is nonrelativistic. Though the relativistic corrections to the Schrodinger equation are minor, they are important. For instance, solutions to the Schrodinger equation with the Coulomb potential do not say anything about spin angular momentum. To get a full picture of spin, relativity needs to be considered. There are other corrections as well, some of which I will discuss later. After finishing our discussion of the hydrogen atom, the professor went ahead to introduce the mathematical formalism of quantum mechanics. This is where we learn about kets and bras; abstract representations of the wavefunction. We also learned some about the Hilbert space, the abstract, infinite dimensional vector space upon which quantum mechanics is performed. We learned a little bit about commutators. We learned about different types of operators, and how they can change wavefunctions. We learned about a specific class of operators in particular, known as Hermitian operators, which are associated with every physical observable. We learned about the Schrodinger perspective and the Heisenberg perspective on how a quantum system evolves through time. We also proved the Heisenberg uncertainty principle in a much more general fashion. There may be things I am forgetting. In this portion of the course we didn’t learn much about physics itself, however we learned a lot about the background mathematics necessary for understanding quantum mechanics. Since I suppose describing physics is a lot easier than describing abstract mathematical ideas, I will leave this section as is for now, since this section of the course can not really be done justice without introducing the mathematics itself. One of the most interesting results in our analysis of the quantum oscillator is the existence of zero-point energy, the amount of energy the oscillating particle has in its ground state (when n=0). The ground state energy of the quantum oscillator is nonzero unlike its classical counterpart. There were two operators introduced in our analysis of the quantum harmonic oscillator: the creation operator and the annihilation operator. The annihilation operator, when acting on a wavevector lowered its energy by 1 state, and the creation operator raised the energy of the wavevector by 1 state. I believe we studied this in preparation for a more detailed study of angular momentum, which used ideas very similar to creation and annihilation. It turns out this equation allows integer values and half-integer values for the angular momentum. The integer values are associated with orbital angular momentum. As it turns out, there is a physical quantity with half-integer angular momentum: spin angular momentum for particles known as fermions, such as electrons. This is a purely quantum quantity, without any real classical analogue. Furthermore, spin cannot be derived from first principles without accounting for relativity. We investigated angular momentum in some mathematical detail using tools very similar to those developed for the quantum oscillator. We also investigated spin operators represented as what is known as Pauli matrices. As I mentioned before, very few problems in quantum mechanics are solvable exactly. There are two approximation methods learned in my class which allow us to say something about a physical system that is not exactly solvable. We are currently working on the variational method. This method allows us to put an upper bound on the lowest energy expectation value for a particle, and make estimations for some excited states. We will be applying this to the helium atom today in class. The other method we have learned for approximating quantum systems is known as perturbation theory. If we have a system that varies slightly from an exactly solvable system, perturbation theory can be used to approach it. One application of perturbation theory is in the study of the Stark effect. Here, a hydrogen atom is placed in an external electric field. In this case, the spectrum of the hydrogen atom shifts and splits. Perturbation theory allows you to approach this effect from an analytical perspective. Perturbation theory also allows us to make some relativistic corrections to the hydrogen atom, correct for the interaction between the magnetic field of the proton and the spin of the electron, and other corrections to the hydrogen atom that the Schrodinger equation could not completely account for.